In Depth Events provides LED video wall rentals, as well as the load bearing structures needed to support large format LED video wall rentals. Our LED video walls (sometimes called Jumbotrons) are used in both indoor and outdoor environments for a variety of different events. Our client list includes LED video walls for concerts, corporate events, EDM festivals, sporting events and marketing firms! If you are looking to make a BIG impact, then look no further! Video production technologies have changed dramatically in the last few years, and LED video walls are lighter, have more resolution, and are brighter than ever before. Nothing attracts consumer interaction and attention like video – and a 40 foot wide screen attracts a LOT of attention! Why should I use In Depth Events for LED Video Walls and Support? LED Video Wall Enhancing the Show! In Depth Events is a turnkey production vendor. To you, the client, that means that all your production rental needs are handled by one company. 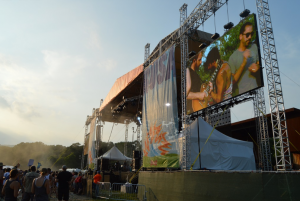 We supply audio rentals, stage and roof systems and lighting rigs, as well as the LED video wall rentals and support structures for your event. Additionally, In Depth Events trucking and logistics staff can take your event anywhere in the United States and deliver the same level of service, attention to detail, and professionalism that has made us the preferred vendor for clients nationwide. 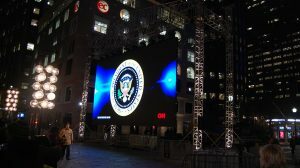 If you are a vendor or production company that already owns your own LED video wall, we’d like to talk to you as well! We’re happy to provide the rigging and support structures to hang your video wall for both indoor and outdoor environments. Ask a Question of the professionals at In Depth Events today and discuss your needs for LED video wall rentals with our friendly event specialists. We look forward to hearing from you and working with you!